Việt Trì is the capital city of Phú Thọ Province in the north-east region of Vietnam. In 2010, the district had a population of 260,288. The district covers an area of 110 square kilometres (42 sq mi). 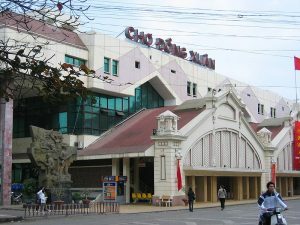 Việt Trì is also the economic canter of the province and contains many industrial firms and service industries. In November, the average temperature is around 21 °C (70°F). 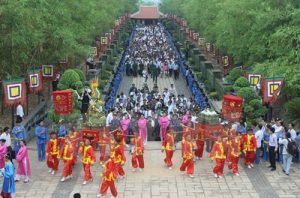 King Huong Vuong’ (the founder of the Viet Kingdom) temples in Hy Cuong within the Vit Tri province are located around 8 km north-west from the University. A number of beautiful Buddhist temples, museums and places of worship are located in this area, including Chua Thien Quang Temple, the King Duong Vuong Temple and the Ho Chi Minh Museum, as well as local eateries and cafes. This meaningful place for the Vietnamese is a great way to spend the day surrounded by traditional atmosphere, historical sights and serene greenery. 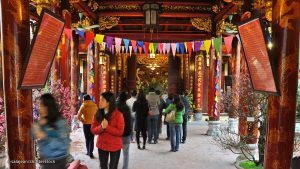 About 6 kilometers away from the city, this temple is considered the most sacred of the historic sites by the Vietnamese. The area is a complex consisting of several temples dedicated to the cult of Hùng Vương – the first descendants of the mythological founders of the Vietnamese, Lạc Long Quân and Âu Cơ. Viet Tri province is located merely 90 kilometers from Hanoi, the capital of Vietnam. Hanoi is known for its centuries-old architecture and a rich culture with Southeast Asian, Chinese and French influences. 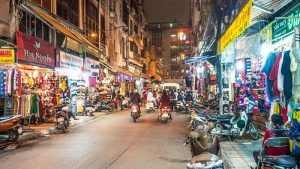 The city consists of two major parts; in the north it’s the old Hanoi, which was the most politically important center of Vietnam until 1802, the southern and the western areas are modern, built by the French during the colonization era. Hanoi became the capital of the whole country after the end of the Vietnam war in 1976. This temple in the heart of the old town is said to be the oldest structure in the city. The legend says it was built by Emperor Ly Thai To in the 11th century to honor a white horse that guided him to this site, where he chose to construct his city walls. A market found in the center of Hanoi, originally built by the French in 1889. It is the largest covered market in Hanoi and you can find everything from clothes, household items to foods. It is divided into three levels and serves as a tourist attraction where you can purchase souvenirs. 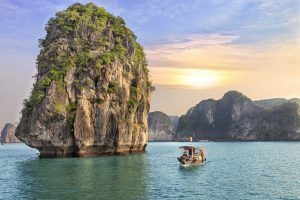 If you have time for a day trip, the Ha Long Bay is a UNESCO World Heritage Site and popular travel destination. It is located about 4 hours from the Viet Tri, on the Eastern coast. The bay features thousands of limestone karsts and isles in various shapes and sizes. Ha Long Bay has an area of around 1,553 km2, including 1,960–2,000 islets. The limestone in this bay has gone through 500 million years of formation in different conditions and environments. Ha Long Bay is home to 14 endemic floral species and 60 endemic faunal species. There are multiple options of guided tours, renting boats and other ways to discover this amazing area.